Patricia Neil Warren has made an unforgettable mark on the LGBT Community, and particularly for LGBT sports. But her story and legacy encompass so much more than a book. Born in 1936 in Southwest Montana, she was the daughter of cattle ranchers Con and Neil Warren. Always having an affinity for writing, she began writing at age 10 and by the time she was 18 her work was recognized when she won the Atlantic College Fiction Contest. Coming off of her first literary success, she went on to college where she earned her bachelor’s degree in English at Manhattanville College in New York in 1957. Shortly after graduating, she married a Ukrainian poet, Yuriy Tarnawsky, where she learned to speak Ukrainian and went became part of the New York Group which was a prominent group of poets made up of Ukrainian emigre Poets. Through the New York Group, she published poetry in Ukrainian as well as English. In 1973, Warren and Tarnawsky divorced and Warren left the New York Group. 1959 Warren got a job at Reader’s Digest where she went on to work for 21 years as an editor. By 1971 she published her first novel The Last Centennial under her pen name Patricia Kilina. Despite positive reviews, the book did not sell well. In addition to writing, Warren was an avid runner. She was one of the first women to run in the Boston Marathon after the Boston Athletics Association lifted their ban on female runners. Prior to that, in 1968, she was part of a group of female runners who worked to open marathon running for women. Warren’s second novel is her most well-known. In 1974 she published The Front Runner which tells the story of a gay track coach who struggles to get a talented openly gay runner onto the U.S. Olympic Team while trying to hinder his love for the athlete. The book was controversial at the time, which made it popular. The book sold 10 million copies and became the first contemporary gay fiction to make The New York Times Best Seller List. Warren came out as Lesbian in 1974 as well. The Front Runner is often cited as the inspiration for the rise of Gay and Lesbian running groups and clubs throughout the 1970s and 1980s. The International Front Runners, which is a large international organization of LGBT running and walking clubs; is named after Warren’s Novel. The first “Frontunners” club began in San Francisco in 1974 but has since expanded to Frontrunners clubs in almost every major American city as well as all throughout North America, Europe, Australia, and Asia. Warren went on to publish The Fancy Dancer in 1976, set in Montana telling the story of a young Catholic priest struggling with his sexual orientation. She also published The Beauty Queen in 1978 which focused on a businessman in Manhattan who struggles to come out to his anti-gay, conservative Christian daughter. After leaving Readers Digest in 1980, Warren became a full-time writer and continued publishing novels, including two sequels to The Front Runner titled Harlan’s Race and Billy’s Boy. In the mid to late 1990s she became politically active and served as commissioner of education for the Los Angeles Unified School District as well as serving on the Gay and Lesbian Education Commission and the Human Relation Education Commission. She was working on the final touches of her final book, the fourth sequel to The Front Runner. 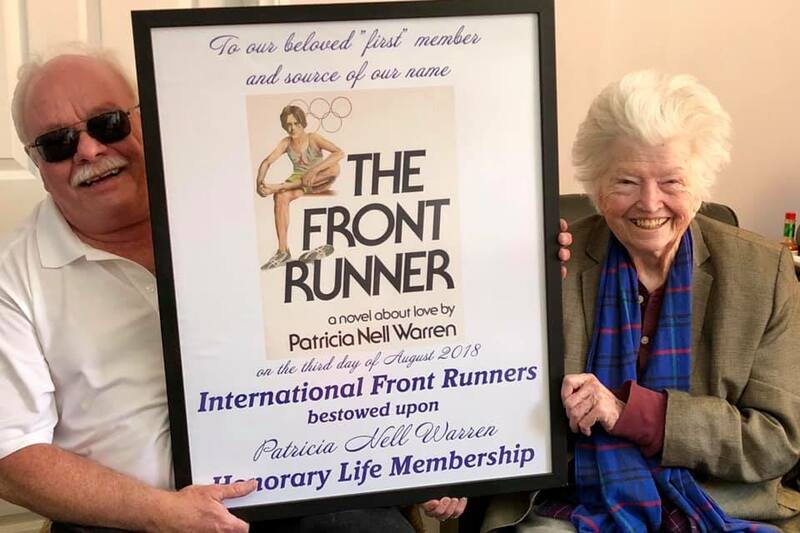 In November 2018, Patricia Neil Warren was honored with a lifetime membership to the International Frontrunners, which recognizes her role inspiring generations of young LGBT athletes and people. She passed away peacefully on February 9th, 2019.